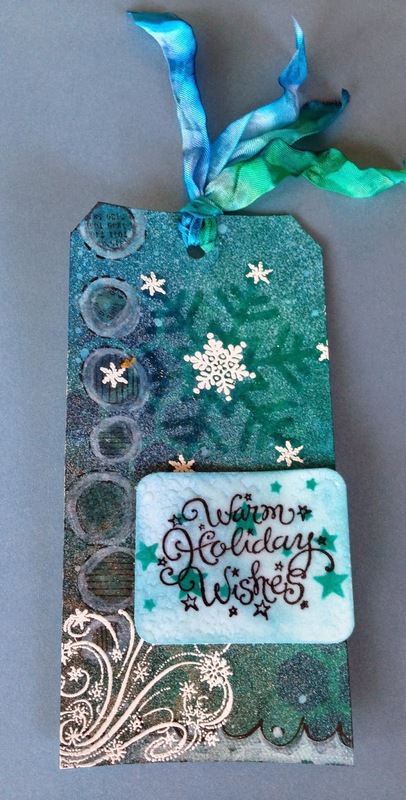 Karla Yungwirth Designs: Stamping, Stenciling and Snowflakes, Oh My! Oh, I'm having so much for taking the Supplies On Hand class by May Flaum! She has such amazing ideas and a fantastic group of guest designers. I have sooo many ideas for using my stash! 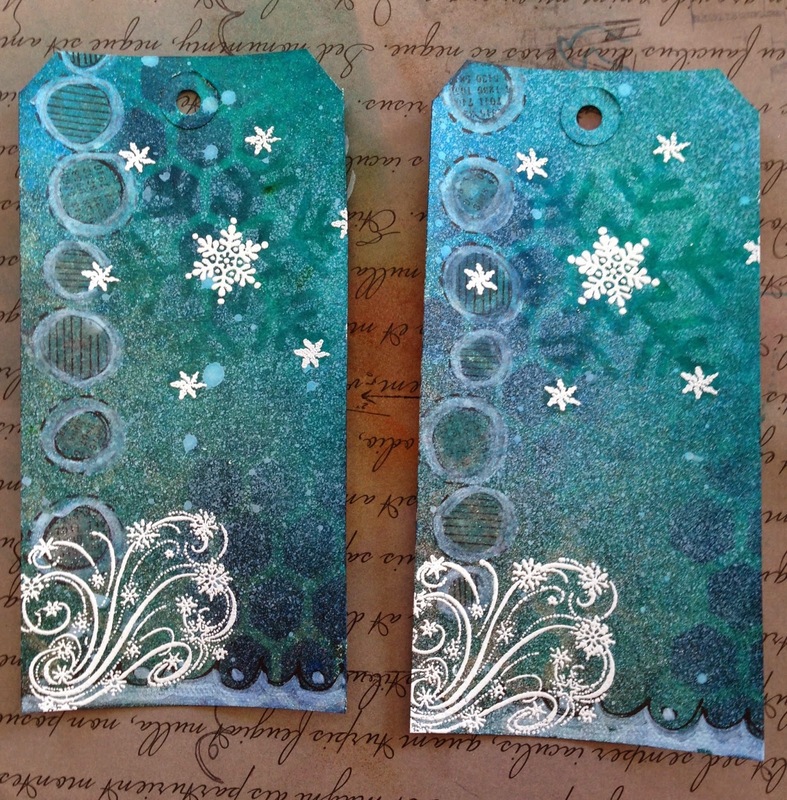 I decided to focus today on the Stamping and Stenciling lesson, and I was inspired by a snowflake layout by May to make some Christmas gift tags. Of course, I absolutely love a mixed media look, so here we go...! I still have my Dylusions Sprays out from the layout I created (you can check it out here) and since I wanted to go with a snowflake theme I thought they would make a perfect background. 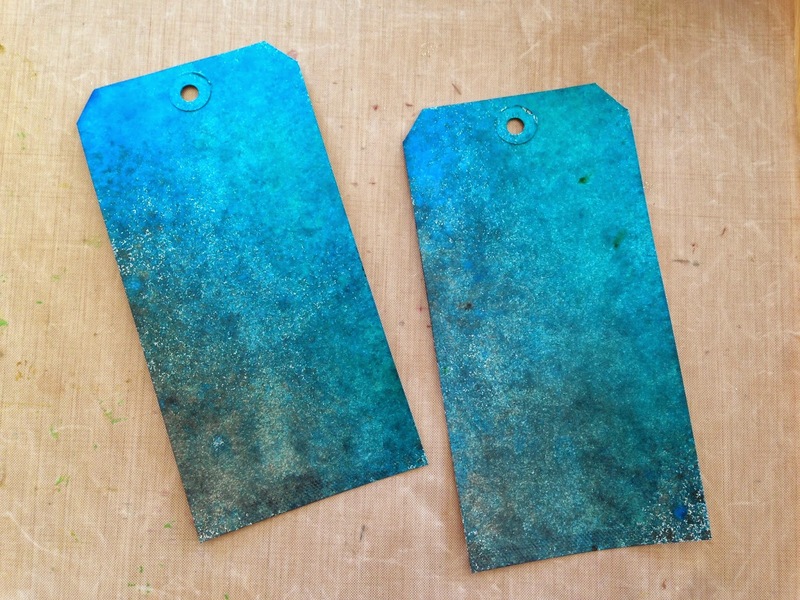 I started by spraying two different blues and a black mist on manilla tags and then daubing them off with a paper towel. 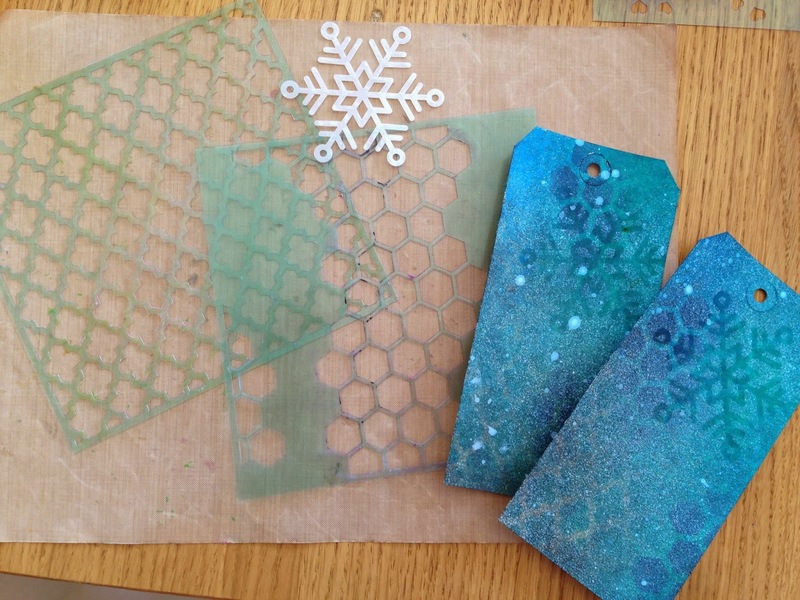 Next I used Pumice Stone and Chipped Saphire Distress Inks to sponge through Heidi Swapp stencils, and then I laid a Simon Says Stamp snowflake stencil down and lightly misted with the White Linen Dylusions Spray. I stamped a scalloped border along the bottom and a circle border along the sides, added highlights with Picket Fence Distress Marker and then white heat embossed some snowflakes and the swirl along the bottom. 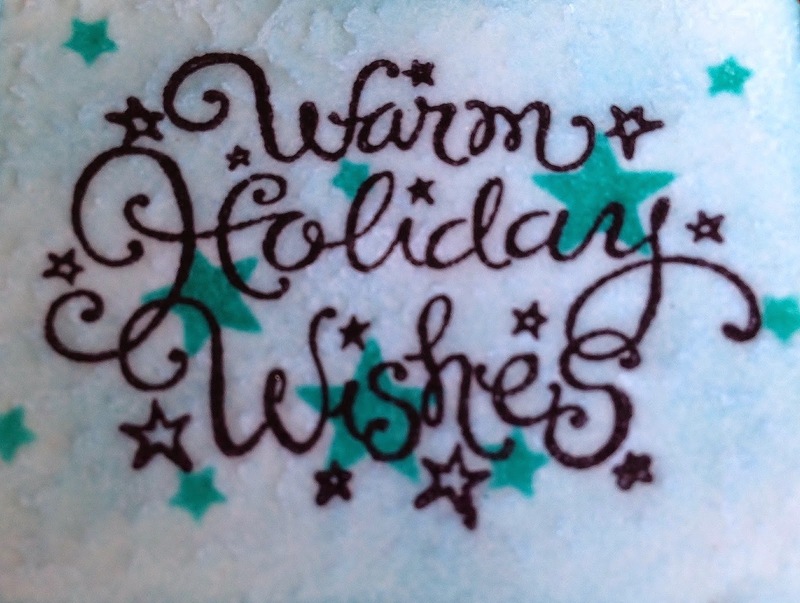 I made the sentiment by stamping on a piece of white cardstock, sponging with Tumbled Glass Distress Ink, and stencilling with Peacock Feathers Distress Ink through a star stencil. Then, I covered the whole thing with Versamark and heated it with UTEE to create s glassy effect. I popped it up with foam dots to give some dimension. I used some seam binding ribbon and sprayed it with 2 blues and a green Dylusions Spray. I let it dry, and it was pretty BUT then I sprayed with some water and oh my gosh! It blended so beautifully right before my eyes! I'm not sure who will get one of these tags, but I sure had fun making them! Be sure to check back - I'll definitely be trying out more ideas from this awesome class! Also, don't forget I'm part of a very Creepy Cricut Halloween blog hop Saturday!! (Details on the sidebar to the top left). There will be lots of fun prizes for hopping along and lots of Halloween inspiration! thanks for sharing them with us over at 613 Avenue create.